There is only one giant squid, her name is Ducky, and she’s orchestrated the greatest prank in history. No, I don’t mean that there’s only one species of giant squid, Architeuthis dux, as was recently revealed by marine science rising star Inger Winkelmann, although it’s true. I mean that there is only one individual Archituethis dux, her name must naturally be Ducky, and, for the last 3 decades, she’s been messing with us. First is Winkelmann et al’s recent report reducing the number of Archituethis species to one. This paper also revealed that giant squid are genetically homogeneous (at least in their mitochondrial genome), leading the authors to conclude that there is a single, globally distributed and well-connected giant squid population. The author’s interpretation is certainly plausible based on this evidence, but there is a more parsimonious explanation–rather than a single population, there is a single squid who’s been dropping “squid molts” all over the world to confuse researchers. Second is this incriminating photo series from the very first time a giant squid was photographed in the wild, in 2005. You can clearly see the squid approaching a baited trap and taking the bait. But what you also see is Ducky’s first mistake in almost two decade, she left two arms behind. Ok, so no big deal. It’s a big ocean, there’s no way that will come back and bite her. …this squid, filmed in 2012, is missing both her arms. The data, both molecular and morphological, are irrefutable. There is only one giant squid. And she just pulled off the greatest prank in oceanographic history. Well played, Ducky. I tip my hat to you. I’m a scientist. A social scientist. Please opine on the validity of my discipline. Haha! 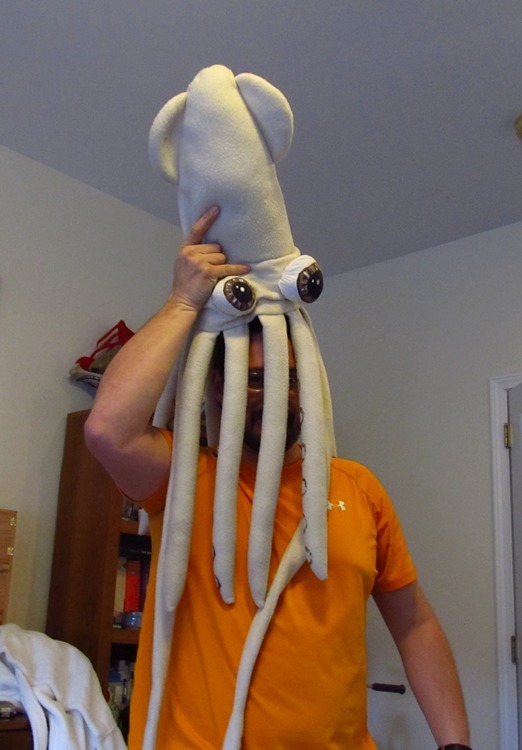 A fine and inventive article designed with the sole purpose of using that photo of you in the squid hat! Love it.